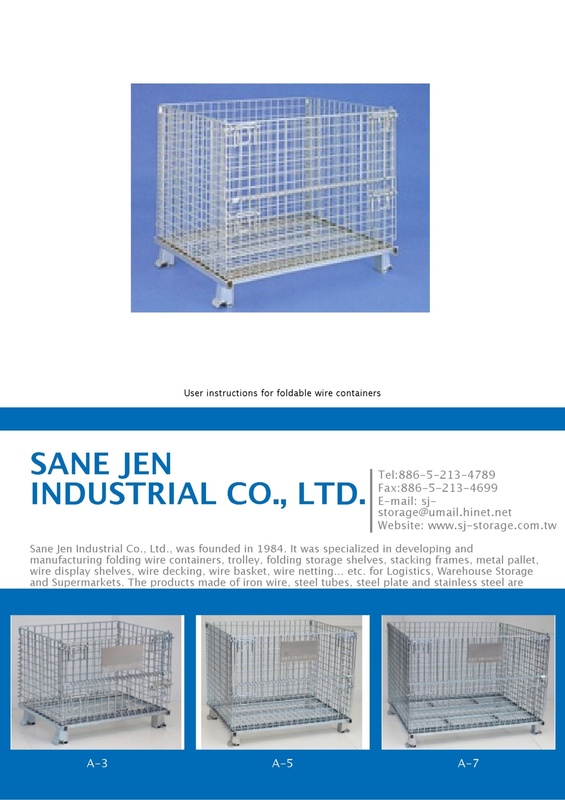 SANE JEN INDUSTRIAL CO., LTD., founded in 1984, is a professional manufacture r in folding wire containers, trolley, folding storage shelves, stacking frames, metal pallet, wire display shelves, wire decking, wire basket, wire netting… etc. 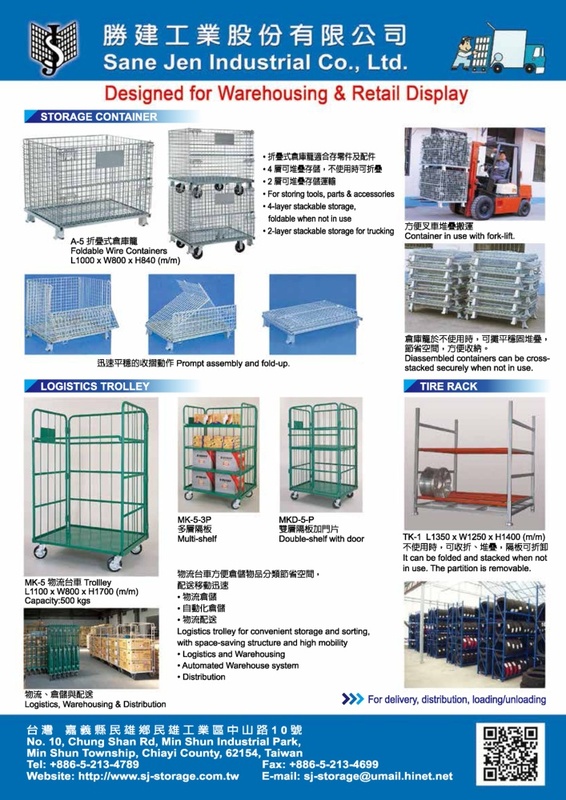 for Logistics, Wire Storage Shelves / Basket Shelves / Mesh Decking, Warehouse Storage and Supermarkets. Most of our products are made of iron wire, steel tubes, steel plate and stainless steel. Our factory is located in Taiwan . Our high-quality products have been exported to many countries worldwirde for over two decades and have gained reputation especially in Japan. Welcome to place your order based on OEM or ODM. 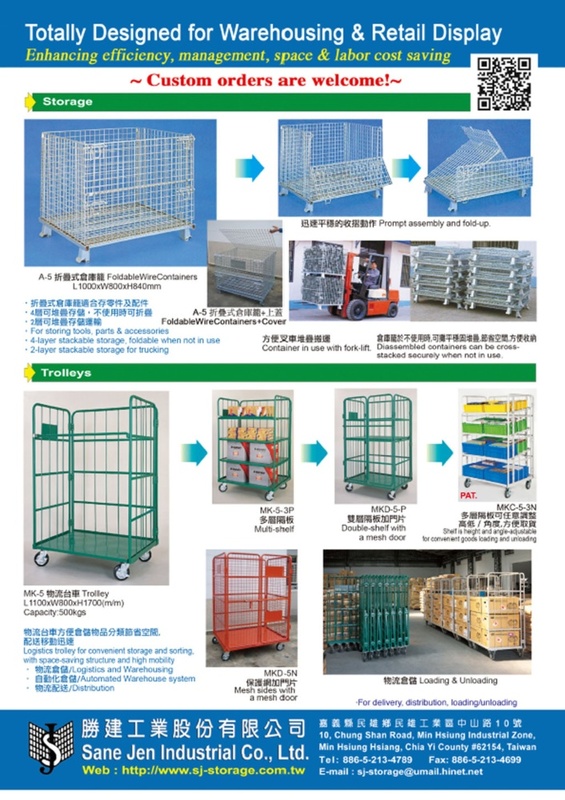 * Folding wire containers, folding storage shelf, stacking frame are good for Storage and Transportation of plastic bottles, plastic caps, automobiles' parts, motorcycles' parts, electrical appliances, mechanical hardware, furniture parts and accessories, agricultural product ( onion, corn, garlic, potato, maize, rice, corn ) ... etc. Several layers' stacking is available to save the space of warehouse. * Trolley makes it easier for people to transport cargos from the original place to the destination. * Wire Shelf makes products of display at the supermarkets vivid. Company Philosophy : Integrity, Trustworthiness, High-Quality Supply and Satisfactory Service. Quality Policy : R&D, Innovation and Insistence. With the high standard of quality control & cooperation with Japanese customers in technology. Minimum Order Quantity : One 20ft container per shipment. Delivery Port : Any port in Taiwan or Shanghai port in China. * Folding wire containers, folding storage shelf, stacking frame are good for Storage and Transportation of plastic bottles, plastic caps, automobiles'' parts, motorcycles'' parts, electrical appliances, mechanical hardware, furniture parts and accessories, agricultural product ( onion, corn, garlic, potato, maize, rice, corn ) ... etc. Several layers'' stacking is available to save the space of warehouse.